Before we move forward with any sale, we want to ensure that our delivery equipment can safely access your property to deliver, for obvious reasons. For off-road deliveries we use 4x4 duallys and hydraulic tilt-deck trailers. We need ample space to enter, maneuver, drop, and exit your property. The driver will need approximately 100' of clear, unobstructed space to deliver (80' total for 20' containers). If there's a gate we would like a two-lane road to comfortably turn into your property, but with country roads, this is sometimes not feasible. If your road is a two lane, or if we have ample space such as a pasture or land, we can turn into a standard gate. If your entrance road is only a one lane (one total lane of traffic or dirt road), we need a a wider gate and room to swing wide off of road. We cannot swing wide enough if you have deep culverts, ditches, overgrowth or other obstructions on either side of the entrance. If your gate has an arch, it must be 13.8' high for a High Cube container to pass through. 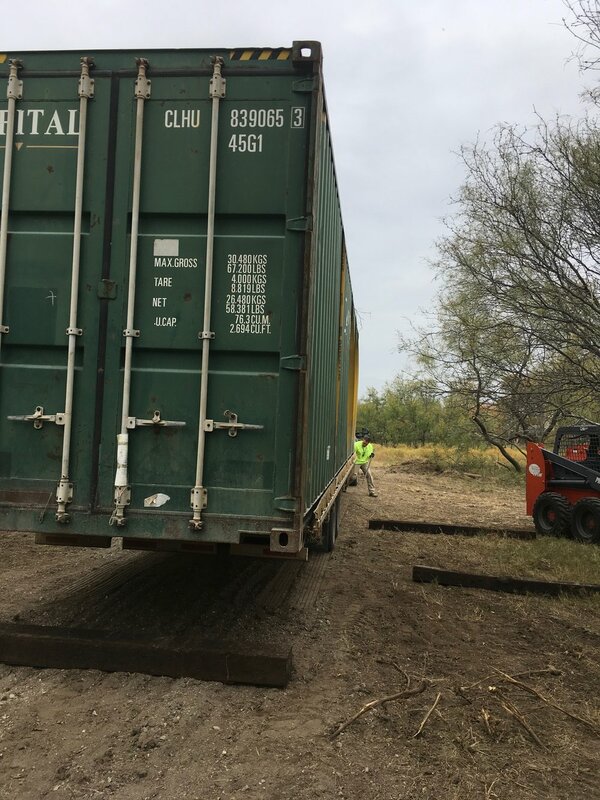 Before delivery, we recommend checking and preparing the ground for your shipping container. 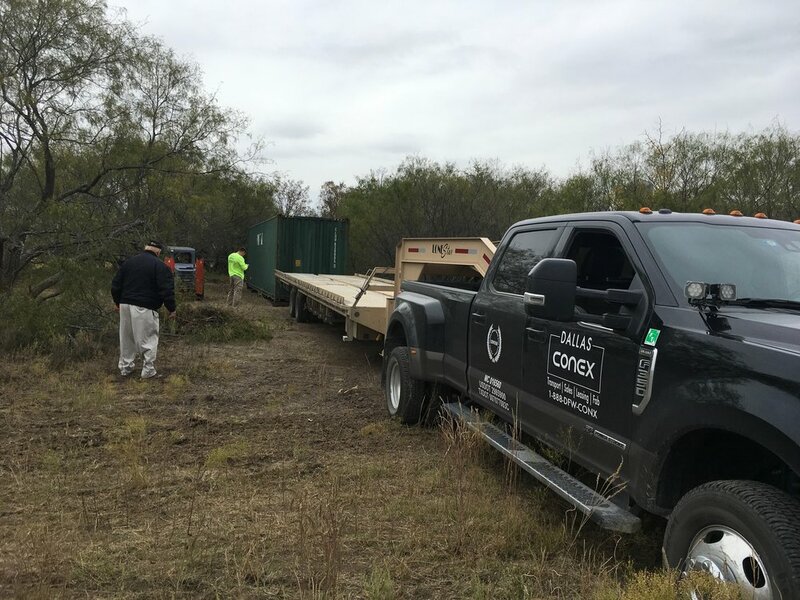 You want a level piece of ground at least as big as your shipping container and accessible to our delivery truck. For our trucks to maneuver for placement and drop, we need about 100 linear feet of space. The trailer is 45' long, and the truck is about 20'. That means to turn around, pull out, etc., we need quite a bit of room with no obstructions. With a High Cube, the truck is 12' 7" before it tilts, and can be up to 18' tall at its peak during delivery. Double check there are no overhead obstructions such as tree branches, phone or power cables that might obstruct the lifting process. The drivers may refuse to undertake any delivery if they risk damage to their equipment, however a delivery fee will still be charged for sending out the equipment. If you are in any doubt over the access we recommend giving us a call and we can discuss any challenges and solutions. Spend some time initially thinking about where you want it before preparing the site for your shipping container. Which way the doors are going to face? This determines how the container will be loaded. Check that you have enough space to open the doors to get in and out. We understand that rain happens! If your ground is soft or muddy, you will need to contact us to reschedule the delivery. The combined weight of the truck and loaded trailer (approx. 34K lbs) will cause it to get stuck in soft ground. If you step on the ground and your foot sinks in or water seeps up, it is too soft. We will always work with you to reschedule! Please note: If the customer confirms that delivery is possible and safe, but upon attempt the delivery cannot be made - a fee may still be charged.